The kitchen is the true center of the home. You cook and eat your meals there, you entertain guests there, and more often than not, the entire family gathers there. It’s the most popular room in the house. After years of constant use, even the best kitchen can show their age. If you aren’t happy with the state of your kitchen, why not upgrade to the remodeled kitchen you’ve always wanted? Whether you’re looking to replace cabinets or countertops, change your flooring, or remodel the entire kitchen from top to bottom, Matthews Construction and Design has the experience and knowledge to deliver top quality results. For more than 48 years, customers in Montgomery County, Maryland and Washington, D.C. have trusted us as their kitchen remodeling contractor. We understand that the remodeling process can be difficult for homeowners, especially during kitchen remodeling. Owner Brian Matthews sets a high standard for his entire team, ensuring that the job site is thoroughly cleaned at the end of each day. We don’t want your home to feel like a construction zone for any longer than necessary. We stay in constant communication with you through the entire process. 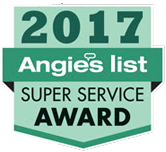 It’s this commitment to customer service that’s earned us an A rating on Angie’s List. Every kitchen remodeling job is held to the same standards of quality and service, from a full kitchen replacement with marble countertops and hardwood floors, to a smaller project like adding a kitchen island. You may not be 100% certain of what you need or want in your new kitchen. You may have an exact idea of how the final result should look. We are here to consult with you and advise you of the most practical and affordable options for achieving the design. In every job we undertake, we bring a creative approach to design and the practical experience of 43 years in the kitchen remodeling business. Replacing your kitchen cabinets can change the look of your kitchen and your entire home, perhaps more than any other single measure you can take. Cabinet styles that were popular 10 or 20 years ago can look weathered and dated after years of use. Replacing hardware and staining or painting cabinets can help, but a complete replacement may be necessary to achieve the look you’re going for. The flooring in your kitchen takes a serious beating, from years of constant use. Upgrading or replacing your kitchen flooring can dramatically improve the look of the room, even if you aren’t ready for a complete kitchen remodel. Hardwood flooring, ceramic tile, laminate flooring, and vinyl flooring are all options to consider. Matthews Construction and Design is the preferred kitchen remodeling contractor for satisfied customers in Washington, D.C, Chevy Chase, Germantown, and throughout Montgomery County. Contact us to schedule a consultation.